A French author writes books on Korea. April. 05, 2018 07:55. teller@donga.com. It is a unique experience to read a book written by French author Elisa Shua Dusapin. 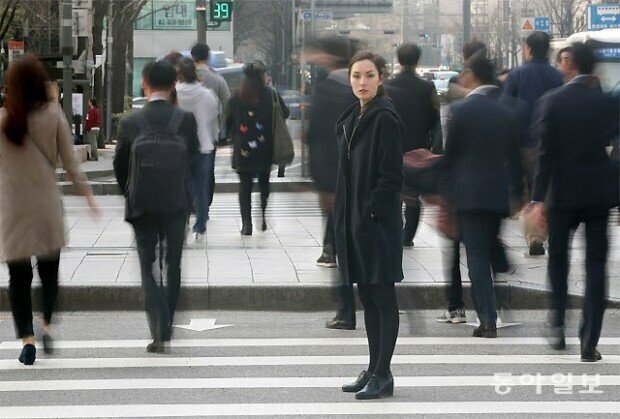 Her debut book “Winter in Sokcho,” released in Korea in 2016, is so Korean from the background to characters that it is difficult to realize the difference one would feel reading a foreign literature. The strange feeling of reading a translated version of a story about Korea written in French can have one vaguely assume the inner side of the author with a Korean descent who started writing due to confusion in her identity. The 26-year-old French author and Korea readers encounter each other in such a peculiar way. Last Saturday, this reporter met Ms. Dusapin who visited Korea to participate in the La Francophonie Festival, hosted by the French Embassy in Korea. Ms. Dusapin, who received prestigious literary prizes including the Robert Walser Prize and the SGDL Revelation Award with her debut book, had a busy schedule meeting Korean readers across the country. Ms. Dusapin said that it was truly a special experience to meet Korean readers. Born to a Korean mother, she understood a little Korean but could not speak the language as she grew up in France and Switzerland. She had French readers in mind when she wrote the book. “I was happy to hear that I expressed the culture of Korea without any distance,” said Dusapin, who never thought the book would be translated into Korean. The author also enjoys reading books written by Korean authors such as Yeom Sang-seop, Lee Chung-jun, Lee Seung-woo and Pyeon Hye-young that are translated into French. She said that it was a particularly unique experience to understand Korea in the era of her grandparents through Yeom Sang-seop. “It was impressive to see various themes that would not be used in French speaking countries such as plastic surgery and state-of-the-art technology,” Dusapin said with respect to contemporary Korean authors.